A recent Discovery Channel documentary called "Humanzee," featured a little known upright walking chimpanzee named Oliver. 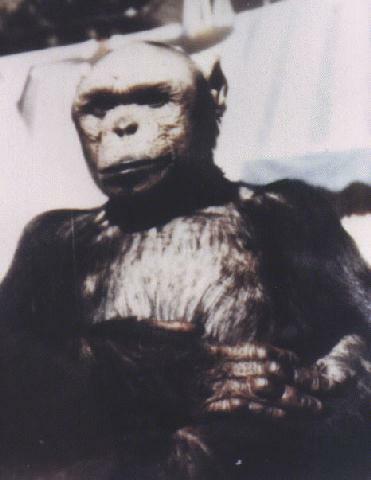 This re-exploitation of a settled issue (that Oliver is a "humanzee," a hybrid or a missing link) was delivered by TDC with all the balleyhoo of a carnival side-show, even suggesting that in spite of Oliver's DNA results confirming him a normal chimpanzee, "something" was different in his chromosomal structure differing him from all other primates -- but what, exactly, was not specified. For those who have heard of Oliver before, he's just a chimp according to test results. For those who have never heard of him, here is his story. Chimp or "Humanzee," Oliver was a remarkable, upright walking chimp who appeared to prefer living and behaving as a human being than a chimpanzee for the better part of his life. Source: By John MacCormack, Express-News Staff Writer for "The Express-News Online"
Unsubstantiated rumors that cytogeneticists determined Oliver's karyotype to be 2N=47, midway between a human and a chimpanzee, led to further popular suggestions that he was a "sport" or a human-chimp hybrid. Two years ago, Science published a news report that Oliver the "'mutant' chimp" was getting a "gene check"
(3). I might add that, from what I have seen so far, those who really want to believe in highly intelligent, bipedal African man-apes ("Apamandi" and whatnot) who continue to elude field primatologists, the bushmeat market etc, will not be dissuaded by any amount of evidence. The persistence of these deeply-rooted beliefs, as psychological facts, are an interesting phenomenon in their own right. 1. Science, 1996. "Mutant" Chimp Gets Gene Check. Science 274: 727. 2. Ely, J.J., Leland, M., Martino, M., Swett, W., and Moore, C.M., 1998. Technical report: chromosomal and mtDNA analysis of Oliver. American Journal of Physical Anthropology 105(3): 395-403. Dr. John J. Ely, Ph.D.